The HOMTOM C8 features a 5.5-inch HD (1280 x 640) display, while it is fueled by the MediaTek MT6739 quad-core processor. The device includes 2GB of RAM and 16GB of expandable storage (expandable up to 128GB via a microTF card). A 3,000mAh battery is also included in this package, as are two SIM card slots. The rear camera 13MP captures each moment with a rather clear memory through many advanced shooting modes. 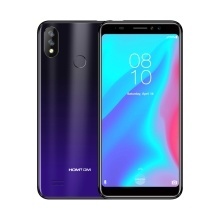 Dual unlocked way – face technology and fingerprint scanner, designed for senstive and fast unlocked your phone, beautiful appearance with twilight color (blue & black) is a exquisite artwork on the palm of your hand. The C8 sports a standard 5.5-inch IPS LCD full view display with 640 x 1280 pixels of resolution, up to 18:9 screen-to-body ratio, and its back cover uses 3D print technology and nanoscale dazzling. Powered by MT6739 Quad core processor coupled with 2GB + 16GB memory for storage many of videos and pictures, the C8 is competitive and meets your daily use. The rear camera 13MP captures each moment with a rather clear memory, and you can also use the Beauty effect, Facial beautification, Panoramic shooting, HDR, Auto-focus and etc. Smarter, faster and more powerful Android system – Android 8.1, to satisfy the increasingly security demands from consumers. Built in 3000mAh battery with low consumption, OTG supported, the C8 offers enduring power for daily use. The C8 adopts smart face ID to fast capture your facial features, and combined with fingerprint scanner, fast making your phone unlocked.